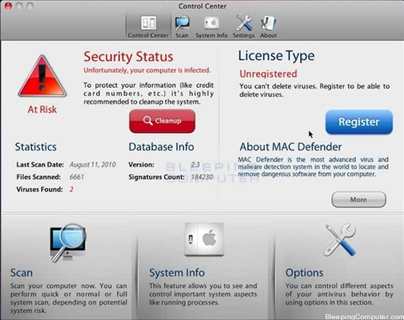 You are here: Home » How to Get Rid of MacDefender Malware? How to Get Rid of MacDefender Malware? If you are a Mac user, you might have heard of or even gotten affected by the MacDefender malware that is affecting Apple Mac OS X users worldwide. For all the hype that the media is causing about this malware, it is petty compared to say the PC virus in the Windows world. MacDefender does not harm your Mac computer. It is a scam to rip you off your credit card numbers. It basically works by displaying a message saying that your Mac is infected with a virus and only MacDefender can remove it. Then it tries to coax you into giving you credit card information. MacDefender targets Safari user. So if you are like me and use Firefox or Google Chrome as your primary Mac browser, then you may not see this malware at all. But, some reports from Apple Store employees suggests that there are a huge number of people affected by this. To add insult to injury it is also rumored that Apple has instructed their retail store employees to not help with this issue. However, the helpful folks at TUAW has posted a detailed explanation on this malware as well instructions on how to remove should you have it in your Mac. Just remember, it doesn’t do anything as long as you don’t provide your credit card number. So, hit the link above to find out how to remove the MacDefender virus from your Mac OS X system.